Premier Steven Marshall was still spruiking the Government’s “in-depth discussions” with Google about shifting some of its operations to Adelaide – days after the tech giant had politely, but firmly, shut the door in his face, InDaily can reveal. Newly-released documents reveal Google executives declined repeated offers to meet with Marshall to discuss an Adelaide venture, with the Government told not to let newspaper headlines “give you pause” because “we’re really not going anywhere”. South Australian media, politicians and business leaders got themselves into a lather back in April after the New South Wales government rejected an unsolicited proposal for Google to become the anchor tenant in a ‘Silicon Valley-style’ Sydney technology hub – prompting national musings about the company shifting out of the harbour city. He went on, explaining that “we’ve contacted Google” and “been able to speak to them” about the “huge amount” that Adelaide can offer. There was only one small stumbling block. But he wasn’t taking ‘no’ for an answer. “Well, I’m not waiting for them to change their mind,” he enthused. “We’re on the front foot – we have already sent a submission to Google. But correspondence published under Freedom of Information laws reveals Google had nixed the prospect that same day, and continued to privately talk down the prospect of shifting staff to Adelaide despite repeated entreaties from high-ranking government officials – even declining repeated offers to meet with the fledgling Premier face to face. The State Government has got on the front foot with web giant Google. The evolution of Adelaide’s Google-hysteria is the archetypal ‘storm in a teacup’. It all started when the NSW Liberal Government rejected a bid by developer Mirvac to build a mixed-use technology hub – with Google as the anchor tenant – that would include an upgrade of Redfern station and a new land bridge linking to the Australian Technology Park. At the time, acting New South Wales Premier John Barilaro said the Government was “not knocking back the idea”, but “all we’re saying is that it will have to go to an open-market process to make sure we get the best return on investment for that site”. In other words, the NSW Government was courting controversy by doing precisely what the former SA Labor Government failed to do with Gillman. The following day, News Corp’s Adelaide chief reporter Matt Smith wrote to the Marshall Government and SA Property Council executive director Daniel Gannon, seeking comment about the prospect of luring Google to headquarter in SA. Gannon was particularly effusive, declaring the story a “cracking yarn”, and helpfully outlining some “important points” as background: that Google had previously rejected a NSW site due to “insufficient transport links”, and that NSW was now “quaking in its boots that Victoria will sneak in and pinch the global tech giant”. “Premier Steven Marshall and Lord Mayor Martin Haese should literally drop everything, get on a plane and do the deal to secure this global household brand,” he said on the record. The documents suggest Gannon, a former Liberal press secretary, then forwarded the correspondence, without further comment, to Marshall’s current media adviser, Ashton Hurn. But Marshall went much further when he fronted cameras later that day, enthusing that Adelaide was “a very attractive place for Google to relocate”, citing “lower costs, a lovely environment for their employees to enjoy – but most importantly a new Government with a focus on entrepreneurship and innovation [which] should sit really well with Google”. On April 19, The Advertiser duly reported that Marshall had “joined in on ‘Operation Get Google’”. But the Operation had already been privately all-but shot down. On April 18, SA’s Investment Attraction supremo Mike Hnyda emailed Jason Pellegrino, the then-managing director of Google’s Australian and New Zealand operations, to spruik “how South Australia can best help” the tech giant meet its ambitions for growth in Australia. “I would also like to reinforce the Premier of SA, the Hon Steven Marshall MP’s and the Minister for Tourism Trade and Investment, the Hon David Ridgeway [sic] MLC’s enthusiasm to meet with you in person at your earliest convenience,” he urged. However, Google didn’t leap at the opportunity. The following day, a more chastened Hnyda wrote to Ridgway to inform him that “I have this morning received a call from Google in Sydney following the email I sent yesterday to Jason Pellegrino”. “The call was from Jesse Suskin, the Head of State Government Relations and Public Policy,” Hnyda continued. “Jesse thanked us for our prompt response to the press article as well as the information and details we had provided in the email at such short notice. This, however, would not have been news to Marshall – because, according to Hnyda, the Premier’s office had already been informed as such the previous day. “I informed Jesse that I had confirmation of Google’s stance yesterday from your office via the Premier’s office, but thanked Google for their personal call in response to my email,” Hnyda wrote. “Google confirmed that should the position change, they would be delighted to meet with the Premier and ourselves. It was, then, just as Marshall had already declared – even if he had buried the lede somewhat. 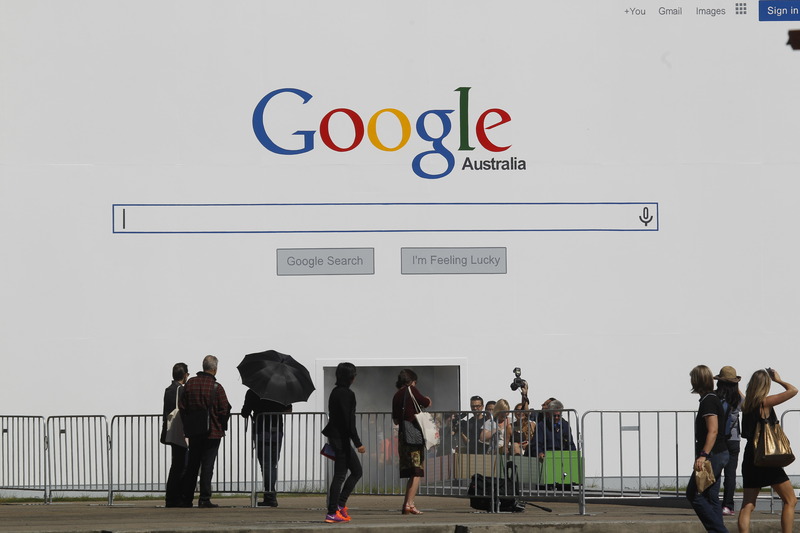 Google were, indeed, “still wedded to the concept of staying in Sydney – and if that changes they’ll engage with us”. But Marshall, firmly aboard ‘Operation Get Google’, was still not waiting for them to change their mind. And the hype of possibility had already become a tad tricky to contain. Riverbank Authority chair – and one-time SA Tourism guru – Andrew McEvoy was dispatched to lobby the global brand. At about this point, fledgling Opposition Leader Peter Malinauskas chimed in with his own hot take. “The Premier needs to get on a plane and make the pitch to Google’s executives face-to-face,” he thundered in an op-ed published in The Advertiser. He even generously offered to “join him to provide a bipartisan approach”, selflessly allowing the Premier to “sit at the front of the plane… I’ll sit at the back”. “We should offer Google a comprehensive incentive package, directly linked to local employment outcomes,” he suggested. Indeed they would. Except that Malinauskas – or someone advising him – would presumably have known it would have been a wasted plane trip. Because Google had given his former Government exactly the same answer – when they sounded them out about shifting to Adelaide three years earlier. On April 27, McEvoy wrote to Stevens, Marshall’s chief of staff, to reiterate that “as discussed, [Google] will not move their entire Sydney team out of State”. “I approached then CE Maile Carnegie about this three years ago and the answer is the same today,” he lamented. McEvoy duly followed up on this ray of hope a few days later, in an email to Temsamani himself on May 1 – with Stevens copied in on the exchange. “Understand completely that Google Australia would be very unlikely to move its entire team from Sydney to Adelaide, but was interested in the idea that a division of Google or one of its many investments could make its home there,” he ventured, adding that Stevens “would be interested in a conversation along these lines”. However, Temsamani gave the duo a polite brush-off. “James, nice to meet you,” he fired back. Three days later, Suskin was back in touch. “Hey James, the head of Google in APAC just forwarded me an email from Andrew McEvoy,” he began, before – in a somewhat patronising tone – reiterating the company’s complete lack of interest. “Its [sic] no problem folks are reaching out (we’d expect nothing less), but I just wanted to let you know we’re still in the same position we were when we spoke last month – we’re still remaining in Sydney, and not exploring options in any other states (regardless of sites, incentives, etc),” Suskin declared, before again spurning the invitation to meet with Marshall (and/or Malinauskas). “If our thinking ever changes on that, I assure you we’ll reach to you to ensure the Premier has a chance to meet face to face with our team,” Suskin explained. Marshall has gamely refused to let the rejection damped his enthusiasm. In an interview published a week later, on the Brand South Australia News website, he remained “very optimistic about the potential” for the old RAH site, continuing to enthuse about the prospect of a Google-led revamp. “There are some aspects of the Google operation which I think will be ideally suited to South Australia and we’re having in-depth discussions with the Google organisation now,” he was quoted as saying. We can always dare to dream.